Marinate the paneer cubes in corn flour, soy sauce, tomato ketchup, and salt. Keep the marinated paneer in the fridge for at-least 30 minutes and maximum 1 hour. Now add the reserved corn flour mixture from the marinade and the paneer cubes. Stir well. 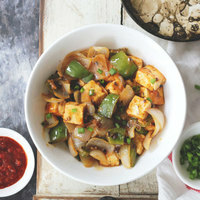 Serve Chilli Paneer with fried rice.